All of the Wikki Stix flower-themed activities are designed with the portable Wikki Stix Traveler Kit. 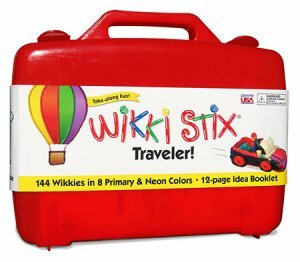 The Traveler Kit contains 144 Wikki Stix, an activity guide, and a durable red case for easy transport. Playful learning can now accompany kids wherever family adventures go! each of those pieces over to form “tear-drop” shapes. Invite the children to assemble the flowers on top of the red Traveler case. The created Wikki Stix petals can be pressed to each of the pinwheel shapes to create the flower. Have the children add an additional Wikki Stix for the stem of the flower. 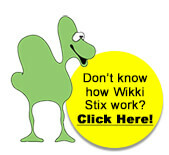 Create any number the children know with Wikki Stix. 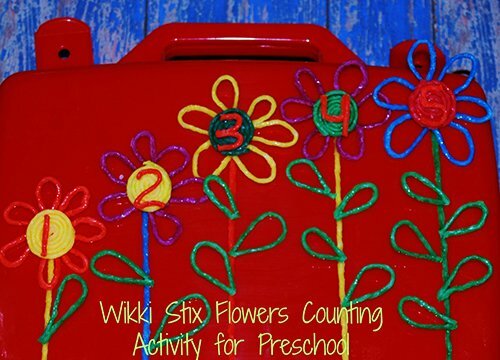 Place the created number on top of the Wikki Stix flower (see photo above). The children can then use the green colors of Wikki Stix in the Traveler Kit to make the number of leaves hat correspond to the number on the flower. The goal is to help young children gain confidence not only with number recognition, but to help them move beyond just recognition and toward the question: How many items make up any specific number? For young kids, begin with the numbers 1-5 and add higher number as they gain confidence in counting. Note: for children under 4 (or children still working on cutting skills), an adult can assist in cutting and creating the individual parts for the flowers then invite the children to assemble the flower parts on top of the case for the counting activity. 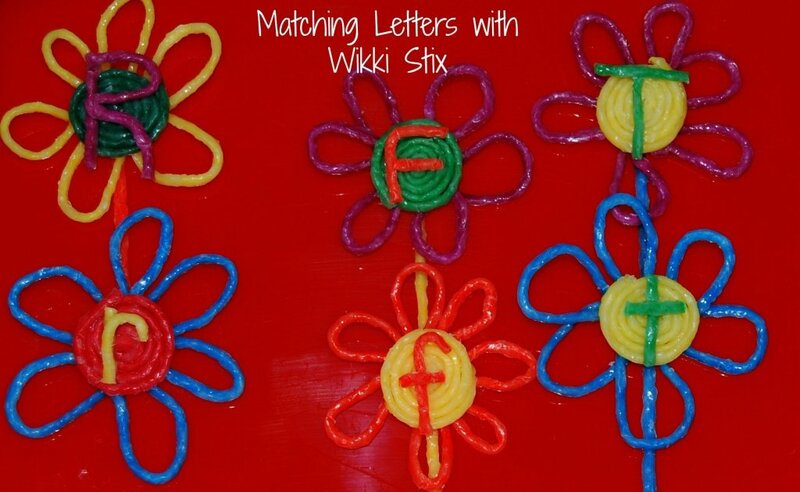 CREATING ALPHABET LETTERS: invite the children to create any letter with Wikki Stix and place it on the created flowers. For younger children, label an index card with the letter and see if the kids can re-create the letter using Wikki Stix. The tactile reinforcement helps the children retain information for basic letter recognition skills. 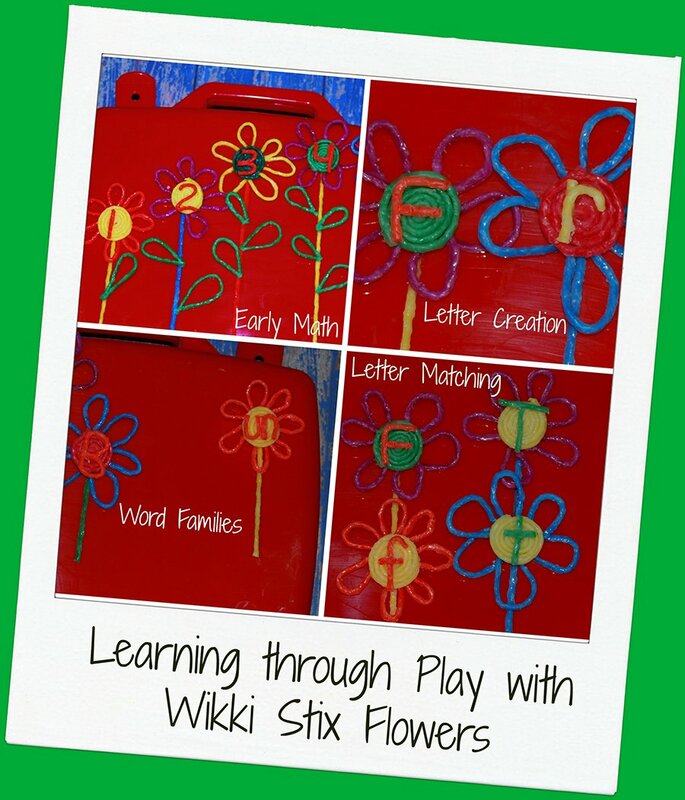 MATCHING UPPERCASE AND LOWERCASE LETTERS: create uppercase letters and the corresponding lowercase letters to place in the center of the Wikki Stix flowers. Randomly place all the lettered flowers on top of the red Traveler case. Invite young kids to match the uppercase letters to the lowercase lettered flowers. 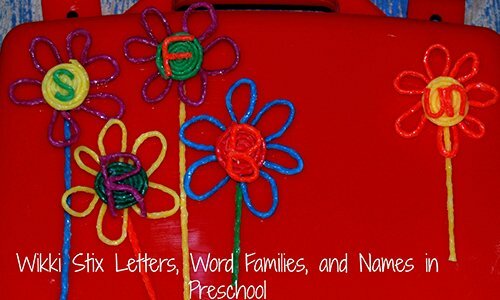 NAMES – invite the children to create the letters in their name (or the names of family members) and place the letters on the created Wikki Stix flowers. Learning names is one of the first literacy activities that are important for young kids! WORD FAMILIES: for children who have confidence in basic letter recognition and sounds, try creating Wikki Stix word families (rhyming words). Create the word’s ending letters (for example: -un, -at, -in, -ar, etc.) and place those letters on top of one of the Wikki Stix flowers. Make separate flowers with each of the BEGINNING letters that will form a word within the word family. In the photo above, children practiced with words in the –un word family: RUN, SUN, FUN, and BUN. Invite the children to place the flowers together, say the letter name and sound of the beginning letter, and practice reading the word. What other word families can your children explore with Wikki Stix? For even MORE ways to incorporate early MATH skills into everyday play, please see the FREE Math Lesson Plan!